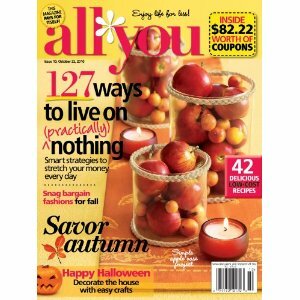 Today you can get a great deal on All You magazine through ShopAtHome.com. Shop At Home is offering 50% back on magazine subscription purchases through Magazines.com. All You Magazine appears to be included. It is listed at $19.97 for a 1-year subscription. After the 50% cash back from ShopAtHome.com, a 1-year subscription to All You is just $9.98 or $0.83 per month! Factor in all of the money saving coupons in every issue of All You and you have more than paid for this magazine! Make your purchase; 50% of your purchase will then be credited back to your ShopAtHome.com account in 4-6 weeks. Not sure what Cash Back Shopping is? Check out my Cash Back 101 post here for more info.